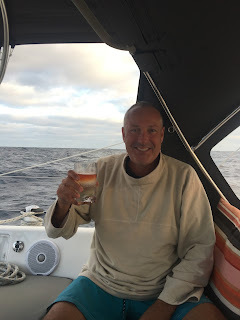 We sailed all day yesterday in winds from the North East that varied from 8 to 21 knots, the sea has gradually been easing and the swell period becoming longer, making it really very comfortable aboard. This morning the sun came out again and when I woke up at 10am (yes seriously I had two 4 hour sleeps last night!!) it was a clear blue sky with not a cloud in the sky. Andrew put the engine on gently at 8.30am as we needed power and were only making about 4 knots with the genoa* banging around - he was sitting on the back deck on a bean bag! * I have been corrected that our front sail is a genoa and not a jib as referred to in previous updates!! We have reviewed the latest weather forecasts and even though we are going to have light conditions for a couple of days we have decided to continue on our course to Barbados - which is south west for a bit longer until we reach the trade winds and then head west. We had in mind that if we needed fuel or were not happy with the weather we may have gone into the Cape Verde Islands; which are now just over 350 miles south of us. Big news from the SSB radio nets - Serenity who is running the OCC net has left La Gomera; so we wished John and Ellie a good first night at sea. Sandra on Blue Roger had a birthday and for the first time we spoke to Neil on Milvina who is in the Cape Verdes. We love our little bit of contact with the other boats - we have seen one cruise ship and that is all since we left. So the eighties music is continuing - I totally blame Lou Cliff for sharing his hard drive. As we are very high brow on Askari I must also admit I am also loving Hamish and Andy Podcast to ease me into my night watch. Oh I forgot - we have now reached in the tropics - yay! Right now we are going to set the sails, maybe the assy……. About 2,220 miles to go to Barbados!